Virginia Pike, from, heh, Virginia, is infinitely more lucky than you. 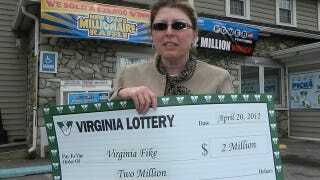 In fact, she's twice as infinitely more lucky because she won a $1 million lottery prize TWICE in the same day. What! "I picked numbers based on my parents' anniversary and their ages at that time, divided by the year they were married"